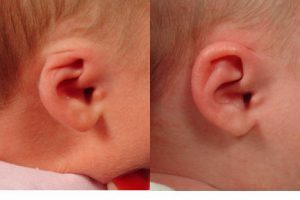 Cryptotia ear deformity in newborn infants is an infant ear deformity in which the upper portion of ear cartilage is partially buried under the skin on the side of the head. Cryptotia is an ear deformity in newborn babies where the ear appears to have its upper portion buried underneath the side of the head. Specifically, the upper part of the external ear is buried beneath the scalp skin. 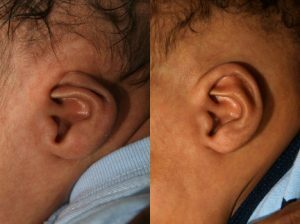 Cryptotia, in Dr. Steve Byrd’s ear evaluation series, is the least common of the infant ear deformities. However, in Asian populations, it is one of the most common ear deformities seen in infants. Cryptotia is characterized by the ear cartilage framework appearing buried beneath the skin with no apparent skin behind the ear. We have long assumed that the outward growth of the cartilage is being restricted by vestigial muscles in the ear. A study by Yotsuyanagi, et. al. 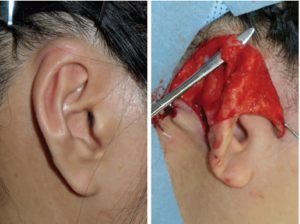 (PRS July 2015) attributed cryptotia to the abnormal insertion of the superior auricular muscle demonstrated surgically in one of his patients (see image). The photo is of an adult patient presented in Yotsuyanagi’s article demonstrating the surgical release of the involved muscle (superior auricular muscle). 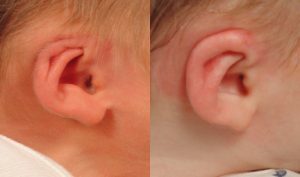 The second image is the same deformity in one of our infants treated non-surgically with the EarWell Infant Ear Deformity Correction System. 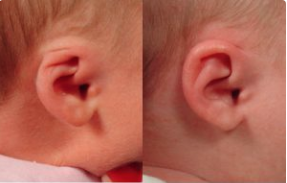 Dr. Steve Byrd’s Infant molding therapy using his EarWell Infant Ear Deformity Correction System involves retraction of the ear to over power and lengthen this muscle followed by shaping the cartilage framework. 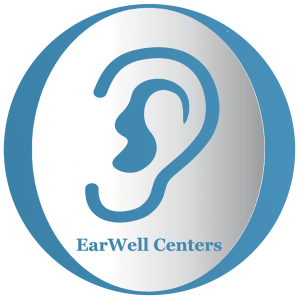 Dr. Byrd generally uses the EarWell correction system in reverse order by initially applying the EarWell retainer tapes to forcefully retract the ear cartilage framework and expand the skin and muscle. This is followed in 2 weeks with the application of the EarWell device to fully shape the cartilage.